Hitchens described Kissinger as a master of “depraved realpolitik” with “a callous indifference to human life and human rights,” who was behind U.S.-backed atrocities in Vietnam, Cambodia, Laos, East Timor, Chile, Bangladesh, Cyprus, Kurdish Iraq, Iran, South Africa, Angola and more. “Political satire became obsolete when Henry Kissinger was awarded the Nobel Peace Prize,” quipped musician, satirist and mathematician Tom Lehrer. 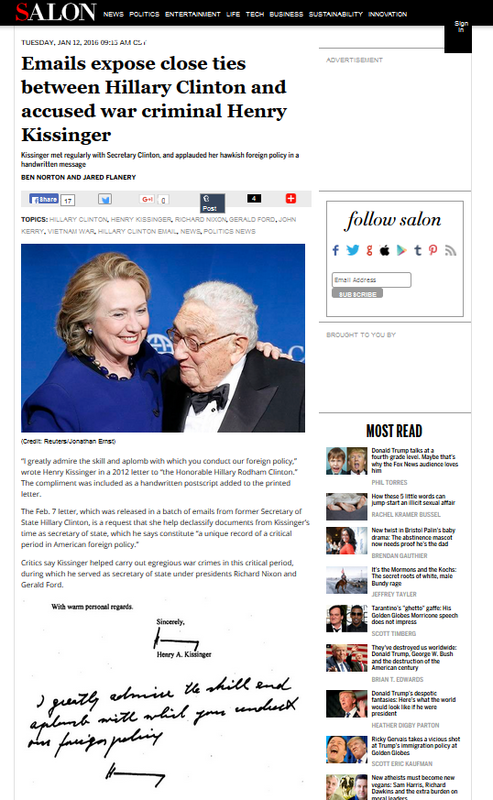 Yet Kissinger’s intimate handwritten note is just one sign of the close ties between the accused war criminal and Clinton, who is herself notorious for advocating a similarly aggressive, hawkish foreign policy. 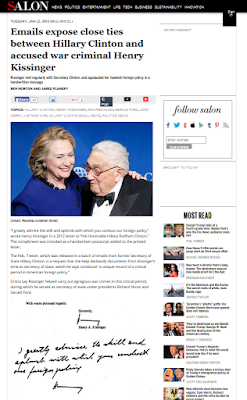 Several emails provide more insight into the cozy relationship between Clinton and Kissinger. In a June 2013 email titled “Startegy memo,” Clinton mentions an upcoming dinner she will be having with Kissinger — along with Cold War-era statesman and National Security Advisor Zbigniew Brzezinski, who pushed for the U.S. to arm Islamic extremist mujahideen militants in Afghanistan in order to fight the Soviet Union, giving rise to al-Qaeda and the Taliban.